As you may notice, I don't spend a lot of time trying to 'clone' commercial beers. I definitely get why you would — being able to brew a duplicate of your favorite (rare, expensive) commercial beer can be extremely convenient, and money saving. But for the most part, it's not what appeals to me about homebrewing. However, after reading an interesting feature about John Kimmich — brewmaster at Vermont's The Alchemist, maker of Heady Topper — where Kimmich attributed part of the huge fruity aroma of Heady Topper to his own proprietary yeast strain... I knew that was something I wanted to look into. Not to clone a beer I love (though eventually, I attempted a Heady clone with my homebrewing club), but to dissect and examine one of the components that makes the aforementioned beer great. Because if you know anything about me, you know that I consider two things to be best in life: 1). to crush your enemies, see them driven before you, and hear the lamentations of their vomen, and 2). Heady Topper. So was I going to culture this yeast for my own nefarious purposes? F*** yeah I was. So here's what I learned about Conan, The Alchemist's proprietary yeast strain. I started with two cans of Heady Topper, fresh from a trip to Vermont. The Alchemist makes no secret of the fact that Heady Topper is unfiltered — a term which just indicates that the brewery hasn't filtered out the yeast. 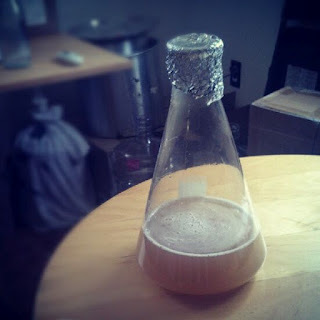 For a homebrewer, super fresh and unfiltered translates to easy yeast culturing. Ten years ago, who the hell ever thought people would be drinking world-class beers out of cans, much less culturing yeast from them? When propagating yeast from a commercial beer, you want to start out with a very small, low gravity starter to give the yeast a foothold. Culturing from a bottle or can demands that you "step up" your starter at least twice before you're ready to brew. So this is what I did: about 10 ounces or so of 1.040-ish wort. I poured about 80% of a can of Heady Topper into a glass for consumption, swirled up the rest, and poured the dregs into the starter. Repeated later with a second can. For obvious reasons, the more cans (and more dregs), the better. Boom. A day or so later, I had a respectable ring of yeast sediment at the bottom of the starter. The freshness of the original beer was a huge help in avoiding lag time. From there, it was a simple matter to step this up to a normal, pitching size starter, after which I decanted off a small portion into a sanitized jar for later usage. Then I pitched the majority of the starter to the IPA I was brewing. Kimmich is spot on in his description of Conan: it is possibly the most aromatic, fruity, pleasant yeast strain I've encountered (outside of Brett and such.) You can read the full write-up of my first Conan-fermented IPA here, but in short, I can pick out a strong component of Heady Topper in my own beer, despite the fact that the two probably don't use any of the same hop varieties. That peach / apricot character he describes translates into a gently-fruity aroma, and really adds extra punch to the tropical fruit character of certain hops. I believe it also makes for a smoother, richer hop flavor. Following my IPA, I brewed a strong winter warmer to be enjoyed in December and fermented it on the Conan yeast cake. Though I'm sure it'll fade with time, especially after I oak-age it, the first hydrometer sample from my winter warmer also had a very clear, specific peach aroma. It shocked me how strong it was, especially in a beer with plenty of dark roasty malts. This has given me other ideas: next time I need a low gravity yeast cake for an IPA, I'm going to first brew a sort of adapted cream ale with Conan. With a few choice malts for complexity and a conservative dose of something like Amarillo for flavor, I think you could have a far-above-average "mainstream" beer — a lawnmower beer with unique complexity. Fortunately, Conan doesn't just taste great — it seems to be an excellent all-around yeast. My IPA, mashed at 152 degrees, hit just shy of 80% attenuation, 1.074 down to 1.015. My winter warmer, fermented on the yeast cake from the IPA, hit 82% attenuation, 1.067 down to 1.012 — though it contained some maple syrup, which is more fermentable than wort. That level of attenuation is great, especially since Conan seems to, paradoxically, somehow, leave a beer with a creamy, full mouthfeel. 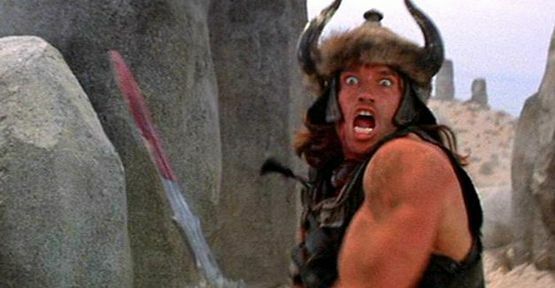 Everything I've had with Conan has had the impression of a richer, smoother beer than its FG would lead you to expect. Actual Heady Topper has a final gravity of 1.010 (shockingly low for the flavor profile, in my opinion), and given the 8% ABV, we can surmise that the original gravity is around 1.070. And while I'm not sure how one accounts for mash temp when calculating attenuation, by my estimates, that puts Heady Topper's attenuation around 85%. I'm assuming that must be affected by either a low mash temp (148 degrees F) or some sugar addition, because 85% attenuation for a brewer's strain is pretty nuts. With more results of Conan-fermented beers appearing online all the time, as well as my own continued experiments, I'm going to pin Conan's apparent attenuation at 80-84% on average. Others have reported highs of 86% attenuation (madness!). The lowest I have seen is 78%, with a high mash temp. It would seem that the large attenuation range can be explained by different generations of Conan: the yeast mutates quickly, and older generations seem to consistently drop in attenuation. Highly attenuating yeasts are typically slow to flocculate — too busy eating up extra sugar to drop out — and so far, that seems to be true of Conan as well. It's a pretty stubborn yeast when it comes to dropping out, and my Conan-fermented beers have been hazy even after a couple weeks in the bottle. (This possibly explains the creaminess I get in the mouthfeel of Conan-fermented beers, too). However, as the attenuation drops, the floccuation keeps pace — as you'd expect. My Simcoe Single Hop Pale Ale, which achieved slightly less than 80% attenuation, is also the clearest beer I've fermented with Conan. In the article linked above, Kimmich alludes to the fact that Conan prefers a certain temp to really draw out those fruity aromatics. I have now fermented beers with Conan on the high-ish side (68-70 F) and the low side (60-62 F). Many brewers, including myself, have been very happy with the results closer to the low side, with Conan starting around 63/4 F and ramping up after a few days. It's not that Conan has produced any unpleasant flavors for me, at any range, but it seems to produce far more aromatic and intense flavors when fermented low. I have let my fermentation temp drop to as low as 60 F with no sign of lag on Conan's part, leading me to believe that it is adapted to ferment at lower temps, anyway. However, mounting evidence from The Alchemist itself suggests that Kimmich ferments Heady Topper somewhere around 68 degrees F, so feel free to push the yeast into the upper 60's without concern. It's a versatile yeast, and not too picky about how you treat it. Wow, great article man. Had my mouth watering with all that heady talk. So, I just stumbled upon this after attempting something similar last night. Sounds like you had good success, so I wish I found your post sooner. I did 200ml of 1.040 wort, about 6-7oz of 4 day old Heady, and a pinch of yeast nutrient. I put it all in a mason jar and sat it on a stir plate overnight. This morning, 12 hours later, it already smells yeasty, so I'm optimistic. Sorry to babble - I actually have a question. You went from 10oz to what sized starter before you pitched your IPA? I'm not sure where I go from 200ml. Jumping up to 2000ml for an actual starter seems like a big leap. Glad you found me and I could be of some help. Sounds you started it out right. My first 10 ounce starter produced a surprising amount of healthy yeast, so from there I stepped up to a 1500 ml starter. I probably could have just pitched that, as my IPA was only a 3.5 gallon batch and I didn't need a huge starter, but I believe at that point I split the 1500 ml starter into two separate 2000 ml starters. One of those 2000 ml starters I pitched into the IPA (which fermented without a hitch) and the second one I let sit for about a week, decanted, and then saved for later uses. Conan seems to get consistent 80 - 82% attenuation in my (and other's) experiences, so it'd be great to hear your results when your own beer is finished. Good luck! Awesome. I think that's a good plan, actually. Stepping up to 1200-1500 and then splitting into two 2000. I might steal that. So, how long did you keep each starter going before stepping up? I was planning 48 hours. So, I'm talking 2 days at each step. Thoughts on that? Yeah, I think it's the way to go, it's definitely worth saving some yeast for later. That schedule seems sound, it's basically what I followed the first time I used Conan. Right now, I'm actually using it again to ferment a single hop Belma IPA. I took my old saved yeast, decanted, and pitched that into a new 2000 ml starter early last week. Fermentation wad done (visibly) after 48 hours, but I let it sit another day or two, then put the starter in the fridge overnight before brewing, decanted the next day, and pitched. Even with that lag time before use, it was fermenting happily within 12 hours. So I think you'll be fine. The other thing I need to update in my entry is temp... I'm pretty sure Conan likes it cool. I wouldn't ferment any warmer than 66, but I'm seeing Conan ferment as low as 60 without getting sluggish. I should have more data on that soon, and of course, I'd love to hear what your results are. So, I ended up leaving them on the stir plate for 36 hours at step 1 and 2. Activity seemed to stop after 36 hours. I had been keeping the starter at 66-68. That was the best I could do in my cellar. I split the 1200ml step 2 batch into a couple jars and threw them in the fridge overnight. This morning, it looks like I've got a relatively thin layer of yeast in each jar. With the little indent in the bottom of the jar, it's hard to tell how much is actually there. In comparison to the vials of White Labs, how much would you say you had at the bottom before decanting and pitching into your final 2L starter? About that amount? I'd say I probably have close to that amount of sediment at the bottom of each jar. Probably a little shy of that. I'm going to decant tonight and start a 2L starter to be used on Sunday afternoon. I might toss in both jars though to play it safe. The DIPA I plan to make isn't cheap, so I'm nervous about a weak fermentation. I'd say I had a little less than a White Lab's vial worth of cells after my first, tiny starter... which again, had two can's worth of Conan dregs going in to start it. My second starter (1500 ml) had what I consider a pitching-rate of yeast (for my small 3.5 gallon batch sizes). Somewhere around 175 billion cells, roughly. It sounds like you already brewed today, so hopefully everything went well. May your air-locks be bubbling soon. I had to wait a week to brew since my starter lagged last weekend. It wasn't ready in time. It didn't do anything for 36 hours for some reason. I was going to assume it was done, but then it suddenly began fermenting pretty hard. It overflowed in my flask, actually, which has never happened. So, I brewed this past weekend. I wanted to use it on an imperial IPA, but decided to try it on a lower gravity beer (1.059) this time, just as a test run. It's bubbling away pretty vigorously, about 24 hours later, so I think we're good. Thanks again for the help as I went through this. I appreciate it. Any time! Glad I could help. I think going for a lower-gravity batch was a smart move. What's the hop-bill like? Definitely curious to hear how it turns out. Got my hands on some Galaxy, so I did an all Galaxy IPA. Thought that the tropical flavor of Conan may go good with the passion fruit of Galaxy. So, total of 3oz of Galaxy in the last 20 minutes at 5 minute intervals and .50 oz as a first wort. No traditional bittering addition. 92% Maris Otter, 3% Honey Malt (nervous about this. May be overkill. Hope not), 5% Crystal 10. I'll then wash and reuse the yeast cake in my Heady clone attempt next, if all goes well. But, I gotta be honest - I'm kind of excited about the Galaxy IPA. Sounds awesome. You going to dry-hop it too? I used 2.2% honey malt in a Galaxy IPA I brewed about a year ago and it came out fine, despite a weird stuck fermentation (it finished at 1.020 instead of 1.015 for reasons I never figured out.) Conan has such high attentuation that it should hold up to some extra sweetness. Would you be willing to send a small vial of this yeast? Your description really has me interested in this yeast and I would love to brew with it. I'm happy to trade for some other yeasts I have or some San Diego beer. Finally the stars are aligning for me to attempt harvesting Conan. I am headed back to VT this weekend to visit the family and am ordering my brother to pick up several 4-packs of Heady Topper. On top of that I finally got my hands on a stir plate and 2L Erlenmeyer. I will probably pitch the slurry of 2-3 cans into a 500mL starter and see where that takes me. Then I plan to step it all the way up to 2L and have enough to brew my Praetorian IIPA and bench a jar or two for later on. Awesome write-up and blog! I keep coming back for more. Thanks! That sounds like a great plan, and what is family for if not tracking down rare beer for you? You should definitely get a good harvest out of 3 cans and a 500ml starter. Probably 2 or 3 step-ups from there and you'll have enough to brew and save. Good luck! Would love to hear your results. Attempted my Conan harvest this past weekend. Not sure how successful it was. Poured the last ounce or so from a can into a starter made from 8 ounces of water and 1 ounce of Light DME. Everything was sanitized and chilled and aerated appropriately. Put that on my stir plate Friday night. Saturday, things still looked the same. Sunday I stepped it up by adding another 16 ounces of water with around 2 ounces of DME and the dregs of another can. There is a bit of condensation on the inside of my flask so I am trying to convince myself that there is activity occuring. I am thinking of stepping it up one last time tonight with an additional 16-32 ounces. Tomorrow I am going to chill it and see what drops out. So far I haven't noticed a change in that clarity of the wort or any noticeable krausen... I accounted the foaming to the carbonation from the actually beer. Just wondering if this sounds correct. What was your experience? Did you allow the beer to warm and go flat before pitching it or did you do it straight out of the fridge, chilled and all. Sounds like you're on the right track but you might want to just slow down the process. Unfortunately growing up yeast from such a the dregs of a beer like Heady is a pretty long, slow process. Stepping up after only two days may have stressed the yeast out a bit... although 2 ounces of DME isn't much. For that first "step" it can take a little while for Conan to show visible activity. I would put it back on the stir plate and let it go for a week. With dregs from two cans, you should definitely get something. Conan is also very slow to flocculate, but after a week or so, you should definitely see a ring of yeast at the bottom. Also since it is slow to floc out, it can be tricky decanting and pitching Conan. If I only need a small starter (>1200 ml), I'll usually pitch the whole thing right from the stir plate. Otherwise I'll try to make the starter sufficiently in advance that I can crash it in the fridge for two or three days, decant and then pitch. Haven't had any trouble with pitching Conan out of the fridge. After 2 days I stepped it from roughly 400 mL up to about 900mL. That sat on the stir plate until Monday at which point I turned it off and just let it chill. I had nice yeast cake at the bottom last night, so I mixed up about a 1500 mL starter (6ish cups of water and 150 grams of DME), decanted 70% of the liquid in the flask and dumped the new starter on top of the yeast cake. I turned the stir plate back on and will let that go until sunday night or so at which point I am planning to let it settle in the fridge, decant most of the liquid, swirl it up and store it in 1 or 2 small Ball jars. I am hoping I didn't stress it too much with my initial ramp up. I have 2 cans left in my fridge in case things go sour, but I am hopeful after the amount of yeast I saw yesterday. Followed your instructions to harvest some Conan for a White IPA and a More Brown Than Black IPA clone. Thanks a lot for the tips. Glad to be of help, good luck! Was Conan used to ferment MBTB, do you know? That would be interesting. I wanted to pick up some of that when it came out and missed it somehow. I'm wondering if you can help with a yeast count. I started with about 25% of a can of Heady Topper (approx 175 billion cells from reading online). I used a 100mL starter, added 400mL, then added 1L, (so 1.5L total), I then cold shocked and decanted, then I used 3.5L. All starter was a typical solution (10mL H20 to 1g DME with yeast nutrients). If I use www.yeastcalc.com, and use "intermittent shaking," I get a final yeast count of 621 billion. Would you agree with this calculation? If not, why? I'm just trying to figure this out. I will admit that yeast counts are not my strongest skill as a brewer, and I often "eyeball it." However, my count is pretty close to yours, although I would be a bit more conservative. To start, I think 175 billion in an original can of Heady seems a bit high. An average Wyeast smack pack only has around 100 billion cells, according to the company, and I can't imagine a can of Heady have more than a smack pack. So I would conservatively estimate that you were starting with somewhere around 50 billion cells. I used the calculator at BrewersFriend.com, and using your steps and set to intermittent shaking, I would estimate you ended up with around 530 billion cells. A bit lower than your estimate, but still a good amount of yeast! Thanks for this great article. I am anxious to try this and have a couple of cans of HT in the fridge. I'm wondering though - I bought these cans at the brewery in March, so they're almost 12 weeks old. Should I even attempt it using these or is the age a show-stopper? I would say that, in general, it's alway worth giving a try. The only real risk you're running is not drinking the two or three ounces of beer that you'll pour out for the dregs. The yeast should either take off or not; once you've stepped it up a number of times, if you are successful, it's not like the resulting yeast will still be "old." They'll just be freshy happy descendants of old yeast. I suspect you could harvest Conan just fine from even older cans of Heady than what you have. I would, though, take it easy for the first few steps. Start with 6 - 8 ounces of 1.020 wort, and wait at least four or five days to step that up again. I've harvested a number of different yeast strains, and I've found it's usually pretty clear when they take off and when they don't. Oh, and the 6 - 8 ounces for the original starter is assuming you'll be adding dregs from multiple cans. If you're starting from only one can, I would go with half of that... just a small amount of wort to give the yeast a tiny snack to pull itself back together. I view the first step not really as propagating the yeast, but more as waking it up from its hibernation. Derek: Thanks for the comments. You pushed me over the edge I was teetering on. I grabbed two cans of 12 week old Heady, sucked down the good stuff, and dumped the rest into a 300ml starter. Left that on the stir plate and I'll be damned if I didn't see a smallish, foamy krausen the following morning. I almost couldn't believe it. I left it in a 68F fermentation chamber on the stir plate for 5 days, and it sure looked like there was some light tan colored powdery yeasties swirling around. Having, as you point out, nothing to lose, I prepared another 500ml starter and dumped that in on top, returned the whole thing to the stir plate in the temp controlled fermenter. Bang! The next morning there was a 1" high krausen festival going on in there. That was this morning. Guess I'll monitor that for a few more days and then decide on the next step, but I figure I'll step it up to maybe 1000ml this time since we seem to have a party going on. I'm so impressed. And I'm beginning to understand why it may be called Conan. This is a beast of a yeast. Anytime! Glad I could provide the encouragement and that it was a success. Harvesting is always a bit of a gamble, especially when you have a yeast that varies as much as Conan does from generation to generation, but it sounds like you got some really healthy guys there. That's awesome. 280 billion cells is definitely a good count... just make sure you split off some of that starter to save for future uses! It's much easier to split up a starter before you brew than to try to wash yeast afterwards (easier on the yeast, too). Okay, since you brought it up... what would be the best way to preserve some of that starter for future use? I've heard people say dump the wort and add some distilled water and refrigerate. Is it that easy? If so - how long would that keep? I usually try to do an extra "step" of starter if I have time... splitting the starter, saving have, and stepping up the other half to brew with. Topping off with pre-boiled water is good, especially if you're decanting and just saving clean slurry, but I don't always take that step. Sometimes I just decant into a sterile jar, swish up some of the yeast, and dump half out. Just be extra careful with sanitation of the storage jar and you'll be good to go! The yeast should last in your fridge for a while. I tend to plan brews around the yeasts that I have fairly often when I have them, so they never have to sit for long... a couple months, then they're back into another starter. But even after 6 to 9 months, all you need is a bit of wort and some action... it shouldn't be hard to tell if it's still alive (same as harvesting Heady, really). Oh, and BrewersFriend.com is a great little site that I wasn't aware of before, so thanks for that too. I checked my steps there and, assuming I got only 10Bn viable cells from those two cans (presuming a low number due to the age), after I get to the 1,000ml starter, I should have 282Bn cells - plenty for just about any gravity you could wish for. Guess Friday is a brew-day. Can't let them yeasties go to waste! Very happy I found this article. Thanks for writing this up. I was able to use two cans and step up a few times and pitched it in a Pliny The Younger Clone. It's still dry hopping but initial tastes are great. It did not attenuate as well as the clone with White Labs 001 that I did side-by-side, but to be fair the White labs was a larger starter. I washed the Conan yeast from primary and hope to use it in an Alpine Nelson clone or something similar to your Citra/Nelson IPA (it sounds great). Probably going to split the starter and save half next time. Washing was a pain. Thanks again! Your website and blogs are great. Glad I could help, thanks for the kind words! Those all sound like excellent brews. I definitely recommend the split starter technique. It requires a little more advance planning than washing yeast, but it's much easier and definitely ensures better yeast health. Sound advice. but of course, I did not follow it. I just wanted to pull the trigger on a Conan starter I had that was ready to go, so I brewed an NB Dead Ringer extract with it. I just racked it to secondary last night and so far, it brought the OG of 1.064 down to 1.013 for an attenuation of 80%. I would expect to get another few points out of secondary so it seems very good. Tasting the SG tube contents was a very satisfactory experience - lots of character! So, I harvested and washed the yeast from the primary and now I've got three little mason jar pint sized soldiers ready for battle. Yes, harvesting and washing is time-consuming, but it feels good to know that I have a successful strain to work with. Since I had never harvested from a can of beer before, I was a little uncertain if the yeast would be good, pure, noble, uninfected, unfunky... So at least now I know. But I have a bigger question: the mason jars layered up very nicely, but not exactly what I was expecting: beer on top, a dark layer, and a light layer on the bottom. I thought the light layer would be second one - and that would be yeast. You know, I remember other people saying that about the weird layering on the HomeBrewTalk thread that got started about Conan. It is very odd, not what you'd expect. I don't think I've seen that myself, but I've mostly just split up starters, so I can't think of when I would have washed Conan anyway. I don't think it's a concern, as you said, you'll be pitching it all anyway. Honestly, I can't think of a reason it would happen. Hey John, sorry for the delayed response. Looks like Philip beat me to it with his response below. He's estimating about 10Bn cells from two cans of Heady, which I agree with. It's a very inexact part of our brewing process, as there are probably not many of us with the equipment to do a truly exact cell count from a can, but work off of that estimate and you should be okay. I started by pouring the last two ounces from two cans into a 300ml starter. The cans were 3-mos old when I did this, so my expectation for viable cells was low. There are a lot of variables and I don't have a cell counting rig, so I just guessed (after reading a lot on the topic) that I started with about 10Bn cells from those two cans. After 5 days, things looked good and I added 500ml more starter-wort. After a few more days, things looked and smelled great and I bottled that and refrigerated for later use. I marked this "~100Bn cells". I plugged my initial assumption of 10Bn cells into the Brewer's Friend Starter Calculator, (http://www.brewersfriend.com/yeast-pitch-rate-and-starter-calculator/ - bottom of page) and punched in my two step starter plan, and it told me I had 100Bn cells. John Palmer also says 1/2-2/3 cup of slurry contains about 150Bn cells, and I had about 1/2 cup of slurry so the numbers cross-referenced somewhat. FWIW, a month later I made another starter from 1/2 that initial starter and pitched it into a Two Hearted Ale clone. I am drinking that now and it's fantastic. I served it at a college reunion this past weekend and we killed a case in no time flat to rave reviews. I got a very entertaining fermentation and in the end, about 80% attenuation, so I'm calling that a success! I'm pulling my hair out here... I've been convinced that I've been infecting each and every starter because i get a tart smell from each batch. I have then been dumping it and trying it again. I'm on the FOURTH ATTEMPT and once again the starter smells slightly tart after about 2 days, similar to an infected batch of beer I had before... I don't want to say "screw it" and pitch the yeast into a 5 gallon batch of IPA only to realize that it is actually infected... but I cant seem to find any other explanation as my sanitizing methods are solid. Do you find that you get ANY tart notes when culturing Conan from the can? Given how many times you've attempted it, I'm guessing the starters are probably fine. I try to not read too much into how my starters smell, unless it's really obviously gone wrong. It's an important barometer for sure, but it has its limits. I personally get a very "bready" yeast smell from Conan starters. I could see a slight tang being a part of that, sure. Maybe instead of pitching into a full 5 gallon batch of IPA, if you aren't sure, brew up a test batch first and see how it does? Maybe a smaller batch of IPA, or a same-size batch without all the expensive hops. You'll get something tasty out of it, I'm willing to bet, and it'll give you an idea of what the yeast is going to do without taking the risk on an expensive IPA recipe. That's the plan I settled on too. I've got a respectable starter now, and even though it has a slightly tart smell, I'm going to make up a simple 1 gallon DME batch with some leftover hops and see what happens. Thanks! Sweet, yeah, here's hoping it turns out great! I'm sure it will, but definitely let us know your results. I'm guessing there are many others who have similar reservations out there. "I captured some of the beer poured off the starter cake. It smelled yeasty and good - maybe just a hint of skunk. It tasted light and twangy. I didn't get a clear aroma of anything off, so it should be good. The color of the cake at the bottom was a good, light tan (not brown like peanut butter)." But I just kinda went with it, and I'm drinking that IPA now - and it's delicious. I harvested that yeast from the primary and I have every intention of using it again. Sometimes you just have to say WTF, right? Good luck with it. Thanks for the words of encouragement! I'm done wasting my DME on this starter. I'm going to pitch it into something small and simple and see what I get! Glad to know I'm not alone. Perfect article for me - thanks man. Coworker just delivered a 4 pack of Heady Topper fresh from Vermont vacation. Plan on using your starter method and the Heady clone recipe in the latest issue of BYO. Cannot wait to get started! A lot of info has been confirmed directly by Kimmich over a year of research by other HomeBrewTalk members, and much of the BYO clone is completely different from what Kimmich himself has said. Granted, Heady is a very tricky beer to clone completely. Our clone is maybe 20% there, but figuring out the exact ratios and timing of the hops is still a bit of a guessing game! Thanks Derek - I was afraid of that. I'd heard criticisms of their recipes in the past, but wasn't sure if that would apply to a brew they featured in an article and everything. I did make their Ruthless Rye clone from the SN issue and it was really on target. I did see yours, and I know there's a thread at homebrewtalk. I know AHS actually sells their take on it in a kit. Maybe I'll give yours a try though!! Brew on! Yeah, I guess it's always hard to know until you brew it yourself. I bet it makes a real good beer, still, and whichever route you take, I would love to hear how it turns out! Great article! My Conan is going strong in it's third day fermenting two 5 gallon batches, but it's definitely kicking some funky aromas - dare I say sulphury. Have you ever heard of this? I may have underpitched and I wonder if I stressed the yeast...I kinda rushed the starter. 20% of 2 cans in 200mL 1.020 wort for one day, then one day cold crash, decant, 600mL 1.035 wort for a day, cold crash, decant, then 1500mL 1.035 wort for day before pitching into two ale batches (using half the starter in each). I'm hoping some time will take care of the funk. Thanks! I can't say I've experienced any sulfur aromas myself, it typically smells very "bready" at the starter stage, and gets pretty fruity during primary fermentation. I have heard from other's that they've experienced all sorts of smells, and I've tasted a few friend's Conan fermented batches that have a very strong Belgian character, probably from high ferm temps. Sulfur should clean up in time though. It'll be interesting to see what the gravity is at the end of the first week, but hopefully by week three or so that sulfur will be cleaned up. Thanks for the reply! I'm fermenting in the high 60s-70. The sulphur has died down as the CO2 activity has died down. I've read that some wheat, lager and even California Ale V yeast can give off sulphur during ferment. It's fun to play the guessing game as to what kind of strain it is. I'm just hoping it's the yeast and not an infection. I'd guess that is probably is the yeast, more likely than infection. I have gotten sulfur from a few yeast strains... mostly English ones, but I don't brew too much with wheat or lager strains. It certainly is fun wondering if any of these things are clues as to Conan's origin. The various characteristics it produces seem to vary all over the place between Belgian and English traits. At least the sulfur has faded, and it's more fruity. How long did your Conan beers 'bubble' for? I know it's not a scientific measurement, but I like to think it's an indication of activity. Interesting. The change in aroma sounds promising, at least. I'd say my Conan beers usually bubble for three or four days, a fairly typical length of time. But on my homebrew club's recent attempt at a Heady clone, the Conan decided to chug away at the last few gravity points for almost three weeks. Great post! Have you brewed a sequel? I need to replace the Apollo hops in the dry hop. My options are Summit, Galaxy, Chinook, Ahtanum. What do you suggest? Not yet! I have a sort-of sequel in mind that I think will be both fun and informative (I'll explain more in a few weeks). Hmm, tough. Summit is probably the closest in terms of dankness but I think it's a bit harsher and more oniony. Maybe a blend of Summit with Ahtanum? This looks like an awesome experiment. I had my first can of Heady Topper last summer and thought it was amazing! I'd love to do something similar to what you did....Any chance you'd be willing to ship a few cans of HT to Seattle? I could reciprocate with whatever beers from Seattle/Portland/West Coast you're interested in...if this interests you, email me at ctiv[at]hotmail[dot]com. Thanks! I wish I had regular-enough access to Heady to send some out! Every couple months a friend will haul some back to town, but unfortunately I really have no idea when the next time will be. I'll let you know if I do get ahold of some more, though... I'm always looking to try more beer from the Northwest! Gigayeast from the SF Bay Area now has Conan, labeled as Vermont IPA. There are three or four places you can order it online. (Distributors are listed on Gigayeast's website). I don't actually have any Conan from Heady at the moment, sorry! As the commentor above noted, you can actually buy Conan online from a few places. The Yeast Bay sells it as "Vermont Ale Yeast," and Gigayeast sells it as "Vermont IPA". I do believe the brewery cold crush to clear up the beer and settle the yeast.